How Long Shall They Kill Our Leaders While We Stand Aside And Look? All over Europe, immigration crisis is the topic being discussed by politicians and the media. They are complaining about the hundreds of Africans in boats trying to reach the shores of Europe but you will never hear them saying that: we are partly responsible for today’s political crisis in Africa. Africa is a land of plunder in the past and today, Europe, the United States and now China, are robbing it every day of all its resources: gold, oil, diamonds, food, coltan, etc. They support corrupt dictators who in exchange for money and power, surrender any resource, feed internecine wars that are necessary to sell the weapons they produce. If the US government doesn’t get what they want in Africa or aren’t interested in a particular government, they will make your life miserable by destabilizing the country’s economy. Corrupt Kabila is no more in power, therefore, the US government must find a way to build a cordial relationship with Congo’s new leader but it seems there is a barrier. The result is America imposing sanctions on three senior officials from Democratic Republic of Congo’s electoral commission, accusing them of corruption and obstructing December’s presidential election. That is what America stands for as a great country, by bullying underprivileged countries. Africa is a rich continent, yet millions of the population live in poverty. Nothing happens in Africa which the West and America don’t know or control. If the US government doesn’t like an African leader, you can easily be removed from power by their clandestine activities. All those who tried to speak against the US government crimes are considered a rebel or a dictator. That's the reason Kwame Nkrumah was overthrown. That's the reason Patrice Lumumba of Congo was killed and that's why Muammar Qadaffi was murdered. Also, that’s the reason Thomas Sankara, the former leader of Burkina Faso, who refused to pay the debt that was strangling Africa, was murdered. A debt that does not belong to Africa and that Africa will never be able to pay, but which serves good Westerners to continue to rob it, to plunder it undisturbed. 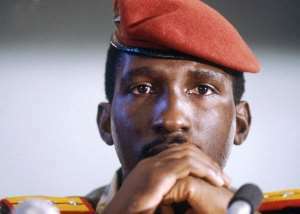 Yet Sankara had shown that in just three years, so long as his presidency is concerned, the poorest country in Africa was managing to live on its own resources without anyone's help. He rebelled against the Monetary Fund, the World Bank. They killed him at the age of 38 and Burkina Faso, the country he sacrificed his life for, returned to being the poor and corrupt country as previously was. The Nigerian writer Saro Wiwa, was hanged with six other activists in 1995 because he defended the people of the Niger Delta from the oil multinationals that are to this day destroying the crops and the ecosystem of the entire region, reducing the already poor populations to hunger. Shell, the oil company was accused of being involved in the Wiwa’s assassination, at a negotiated trial, while the world was silent. The world continues to be silent over every crime the US government commits in Africa, including Aids and Ebola, yet complain about the boats full of desperate people in search of their lost dignity and their future that was denied. What goes around comes around. Africa, the continent which has been rejected and becomes a deliberate target of all sort of crimes against the population, will one day become a safe haven for millions of people fleeing from Europe and America. Africa must unite. The leaders must utilize the resources and change the sad chapters of our political history to prosperity. "No pain, no gain and it's always better to try and fail than never because out of failure comes success."